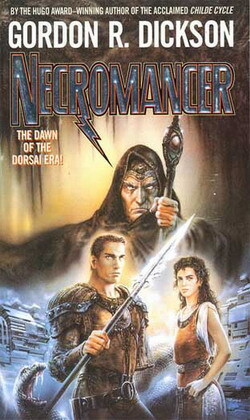 Necromancer follows the fortunes of Paul Formaine, a mining engineer in the late 21st Century who endures several accidents. His quest for self discovery, and recovery from losing his arm, leads him to embrace the Chantry Guild. The Guild embraces a philosophy of destruction with the hope of making space for the rise of a new evolutionary form of humanity. The instrument in their goals is the somewhat melodramatically named Alternate Laws or Alternate Forces.